Garden City, New York, USA. June 21, 2018. Space Shuttle Astronaut MIKE MASSIMINO, a Long Island native, gives free lecture in JetBlue Sky Theater Planetarium at the Cradle of Aviation Museum. 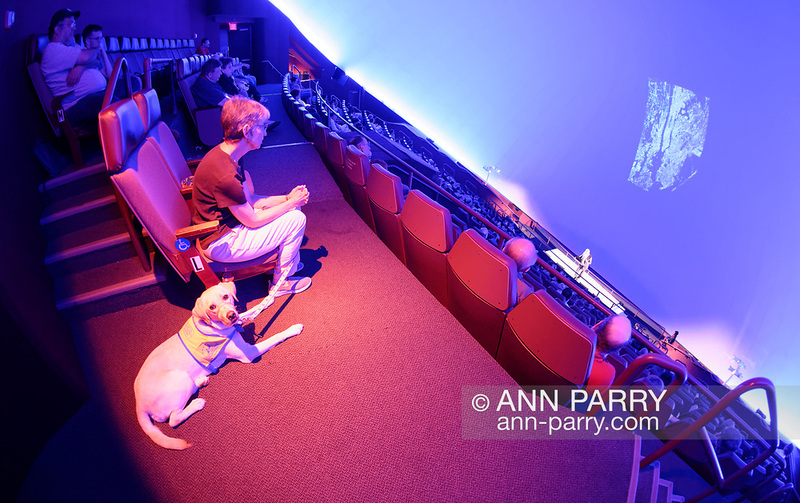 Seated in audience at left is volunteer puppy raiser FLORENCE SCARINCI with dog she is training from Canine Companions for Independence, a Medford organization. Evening with Mike Massimino lecture is part of the museum's Countdown to Apollo at 50, celebrating 50th anniversary of Apollo 11 moon landing on July 20, 1969.